I lived in Washington county for 5 years. Let me just say never ever again. There is absolutely no support for transit unless you're in Stillwater. It's just no fun being there, future isn't very bright. Not just transit. I was visiting family last week and decided (foolishly) to walk from Central Park north to find lunch. I used to walk as a kid and didn't realize how terrible it really was in Woodbury. It took me a full four minutes to cross from the SW corner of Radio and City Centre Dr to the NE corner. Minimum 45 second wait for every walk signal, and a pause in the median because the signaling is clearly meant to allow going that far and no more. The median that serves NO PURPOSE but to widen the road by a good thirty feet. And shade? Pfft, forget about it. It's small wonder that some people in Woodbury don't understand the concept of not driving every single time they leave the house without their jogging shorts. Snelbian wrote: It's small wonder that some people in Woodbury don't understand the concept of not driving every single time they leave the house without their jogging shorts. So many anti-transit people wave the "transit is just social engineering!" flag. I've had more than a few have moments of clarity when pointed back at them that a car-dependent environment is as equally "social engineering". They honestly just never thought about the reverse proposition. That was one of the first among many positive changes since that time. IIRC, the initial Route 50 service operated every 30 minutes, as opposed to the 10 minute frequency it has now. And tangentially related to the conversation about Woodbury, the clip mentions the beginning of the Woodbury-Minneapolis express service. Thanks for posting that, Mulad! Really cool to hear. I saw on Twitter that the last 50 is leaving Minneapolis at 6, I'm going to try and get a picture of it as it passes through campus. http://www.twincities.com/transportatio ... ght-future mentions fare free zone again. How is that supposed to work? They're going to issue special go-to cards for University people who don't have U-passes or Metropasses, which will allow them (us) to move among the University stations without paying anything. It won't be a fare-free zone in the way that the airport is - everybody has to have a valid pass. It's just that University people will have the chance to get a valid pass that doesn't charge for those rides. talindsay wrote: They're going to issue special go-to cards for University people who don't have U-passes or Metropasses, which will allow them (us) to move among the University stations without paying anything. It won't be a fare-free zone in the way that the airport is - everybody has to have a valid pass. It's just that University people will have the chance to get a valid pass that doesn't charge for those rides. That's an interesting way to do it. 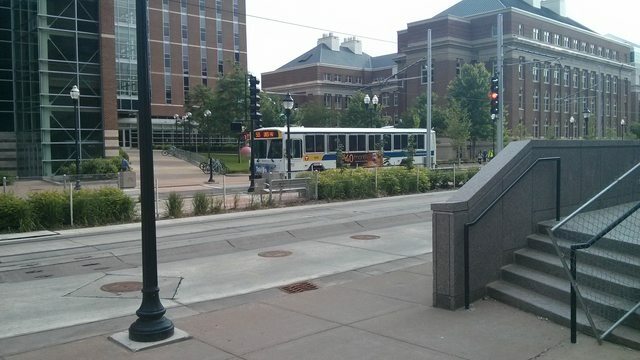 Is the University paying MetroTransit for those special passes? So, essentially you could get on at the university and ride it... well anywhere it goes, and then have to pay to get back because the station you get on for your return doesn't accept that pass? TommyT wrote: So, essentially you could get on at the university and ride it... well anywhere it goes, and then have to pay to get back because the station you get on for your return doesn't accept that pass? No, it's only going to be good for travel among the three campus light rail stops. Technically nothing *prevents* you from going to any station, but that's true for everybody. You'd still get the $180 fine if you didn't have a valid ticket beyond the University area. Right. Anyone can get on without paying at any station and ride it anywhere it goes, unless there's a ticket check while they're onboard. If you show the cop a University train pass, or whatever they call it, and you're not between Stadium Village and West Bank, you'll get ticketed. People who ride the Blue Line more often than I do, how common are ticket checks these days? I rode from Nicollet to MoA, then from MoA back to DTE after work a couple weeks ago, and was checked on both rides. Is that normal, or a fluke? Also, do they ever actually scan Go-To cards to make sure they're validated? Both times I just pulled it out of my wallet, and they glanced at it and moved on. The last time I've been checked was a few years ago (though I don't ride that often) around 11 PM, while the train waited to depart Warehouse District (this was before Target Field station opened). I was sitting in the back of the car, and there were 5 or 6 black kids between me and the door. The officer checked all their passes, but as I pulled out my wallet to pull out my go-to card and he just waved me off. White privilege/racial profiling in action I guess (they all had valid fairs, for what it's worth). I was on a car that was ticket-checked a few weeks ago. I think I've been checked a total of 3-4 times over the years, but I don't think they've ever actually had me tap my go to card, just moved on when I pulled it out. FISHMANPET wrote: I was sitting in the back of the car, and there were 5 or 6 black kids between me and the door. The officer checked all their passes, but as I pulled out my wallet to pull out my go-to card and he just waved me off. White privilege/racial profiling in action I guess (they all had valid fairs, for what it's worth). Reminds me of the time I was on the 21 and someone hopped on after stealing something from a store. The bus stopped several blocks later and the police got on. They said they were looking for a black guy with rows. The cops picked out a kid (who had nothing close to rows) and people on the bus said, "That's not him!" One of the cops reposnded, "well, tell me who it is then." A bunch of people pointed to the thief. The cops took both of them out. People protested loudly but the cops didn't listen. Crap like this goes on all the time and most white people either don't know or don't care. Pivilege indeed. I have had my Go-To card scanned by transit cops and by conductors on Northstar trains (I think once or twice by county sheriffs on Northstar too). They used some flip-phones to do the reading, but they weren't very sensitive and had difficulty reading my previous card a few times. My old card did eventually degrade enough that it couldn't be read on buses either and I had to replace it, but it's not good to have the enforcement folks using devices that aren't as sensitive as the regular readers. The most recent times I've been asked to show a ticket on the Blue Line, I've just flashed my card and the cops have moved on. They might be low on the old flip-phones that they'd previously used. My older Samsung Galaxy S2 was able to detect my Go-To card with its NFC reader, but couldn't pull any data from it because it needed to submit some sort of encryption key, I think. My new HTC One m8 doesn't seem to detect it at all -- I'm not sure if that's because it doesn't speak quite the same protocol or what -- or maybe newer software ignores cards that it doesn't have a good key for. Anyway, they might be short on handheld devices that can read the cards, depending on the exact implementation used. I don't know a whole lot about that stuff, though. FISHMANPET wrote: The last time I've been checked was a few years ago (though I don't ride that often) around 11 PM, while the train waited to depart Warehouse District (this was before Target Field station opened). I was sitting in the back of the car, and there were 5 or 6 black kids between me and the door. The officer checked all their passes, but as I pulled out my wallet to pull out my go-to card and he just waved me off. White privilege/racial profiling in action I guess (they all had valid fairs, for what it's worth). Same thing happened to me on the Blue Line a few years ago, the guy just barely glanced at my ticket, while a elderly black woman had her ticket scanned and closely analyzed. I rarely ride the train but that was sad to see white privilege, and I was probably more likely to be riding without a valid ticket as a teenager than an elderly lady in the first place. I've got a Nexus 4 with an NFC reader but it can't read the Goto card. The reason is that the NFC chip it uses is out of spec, it's a so called 8k NFC chip (8k of data) but again, it's out of spec. The actual spec allows (I think) only 1.2k of data. My Car2Go card is NFC, and my phone can read it.